A smallish frog usually coloured brownish or tan above and whitish below, and often slightly spotty. They have a fairly blunt snout, large dull orange eyes, webbed toes and large toe pads. On warm, wet nights their soft but quite persistent 'wreeeek' calls can be heard from in and around rainforest freshwater streams in the Daintree lowlands. Here, they are usually found on the boulders in and around the creek, and occasionally on the lower surrounding vegetation. 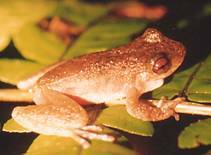 This is one of the 'disappearing frogs', the rainforest frogs affected by the population reductions since the 1980's.